My Book-a-Week Challenge: Whales on Stilts! Because how often do you find a book with an exclamation mark in the title? 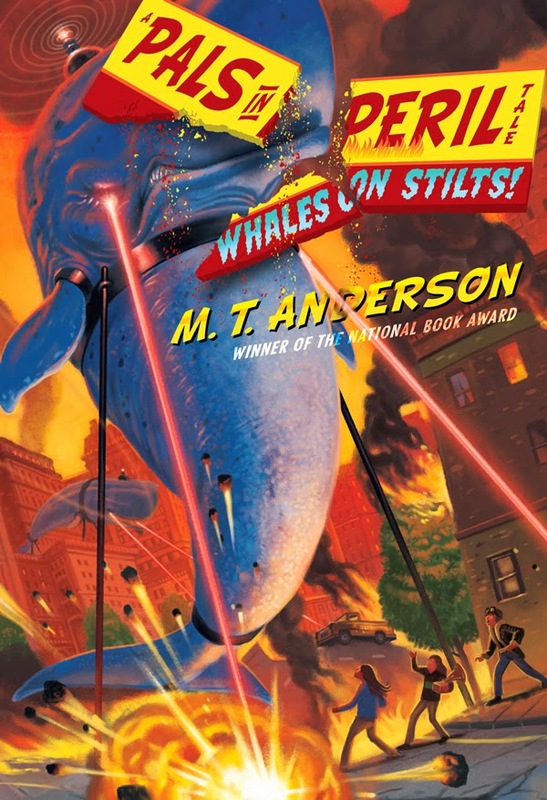 Whales on Stilts is a book I found at a book market I attend every year, and where I try to find at least one Completely New Thing every time I go. This one cost me no more than 99 cents, so I figured I didn’t have much to lose. And yes… it’s hilarious, but not anything new, because this book is exactly what Creative Writing is like. “Lily Gefelty is just an average twelve-year-old girl. But her dad- a normal-enough seeming guy- just so happens to work for an evil genius who plans to unleash an army of extremely cranky, stilt-walking, laser-beam-eyed whales upon the world. And apparently this won Publishers Weekly Best Book of the Year and Child Magazine Best Book of The Year. Colour me surprised. For this review I want to do something different. At the back of the book there are some questions in case this book is used for a book club meeting, so I will do my very best to answer them here. 1. Who chose this book? 2. Can I hit him/her in the stomach? 3. Which Character is your favourite character? Probably the pet rat named Nimrod that Katie’s writers created. He’s a scoundrel, but he’ll worm his way into your heart. 4. Out of all the page numbers in the book, which one is your favourite? Discuss. Are you asking me what my favourite number for a page is? Or if there was a particular page I liked and you wonder which number that was? *pauses* well the answer to both of those questions is 42, actually. “Yes indeed. And so it did.” He flung open the panel. “All ingeniously copied and transcribed onto one convenient wax roll, quite easily carried between the three of us.” He hefted one end of the wax roll; it was as big as a carpet. “May. Just may?” Larry, the evil genius asked. 5. What’s that out the window? Probably a toothed whale, like an orca (not a dolphin. I don’t trust those dope-smiles). If I’d be driving a huge whale I don’t think I’d feel like I was any more in control than a fly on a car. 7. In the scene with the giant starfish, who should have picked up the powdered sugar? a. Katie, b. Jasper, c. Maeve, d. Whoever spilled it, thank you very much, or e. Nimrod, the debonair pet rat. What antics! This must be a trick question. Or I’m missing a large chunk in the book. I don’t trust you, stomach-kicking person. 8. Which whale book with a character named Lily and another one named Jasper is your favourite? … This one. I don’t think I have an option. 10. Lily notices many strange things around the streets of Pelt. What strange things do you notice around your town? 11. Should you report something like that to the police? Only if they have a ghostbusters badge on their scouts sash. 12. Jasper Dash owns a pair of electric pants. If you could electrify any article of your best friend’s clothing, which would it be, and how many volts? This question makes me think of dirty things. 13. What do you think the theme of this work is? Please hum it in its entirety. a. the plight of Pelt, b. the terror of whales, c. too many fictional helmets, d. you are reading this book, or e. Ann Mowbray Dixon-Clarke. Because they’re delicious, goddammit. Although I realise I really am the Fry in the Futurama-dish. 16. In one scene, Jasper Dash wears a futuristic photocopier-repair outfit. If you were walking down the street and one of your friends came up in a futuristic outfit, for example some futuristic shorts or maybe a futuristic swim cap- on a bright, sunny day, let’s say, and the swim cap was green and sparkly, and this friend comes up, and you haven’t seen her for three days because you’ve had a lot of work to do around the yard because your parents hate saplings, and you’ve been burying your head in The Chronicles of Chowder #7: The Saw That Cut Time, and haven’t come to the phone ever when your friend called, and now you see that your friend is wearing this outfit, and across the street there are three guys who you know a little bit from 4-H, would…um…I forget the question. Could I borrow some gum? only if he’s cleaned all his baleen after dinner.